This perennial plant has weak, often creeping or climbing stems that reach 80 cm long. Its leaves form whorls at intervals along the stem. Each whorl has 4-6 unstalked leaves measuring 1.5-4.5 cm long. Leaves are elongated, with hairy edges and a single vein bearing hooked bristles on the underside of the leaf. The tiny white flowers appear in loose clusters of 3 (usually), on stalks from leaf axils or at the end of the stem. This species releases a sweet vanilla-like scent when bruised or while drying. 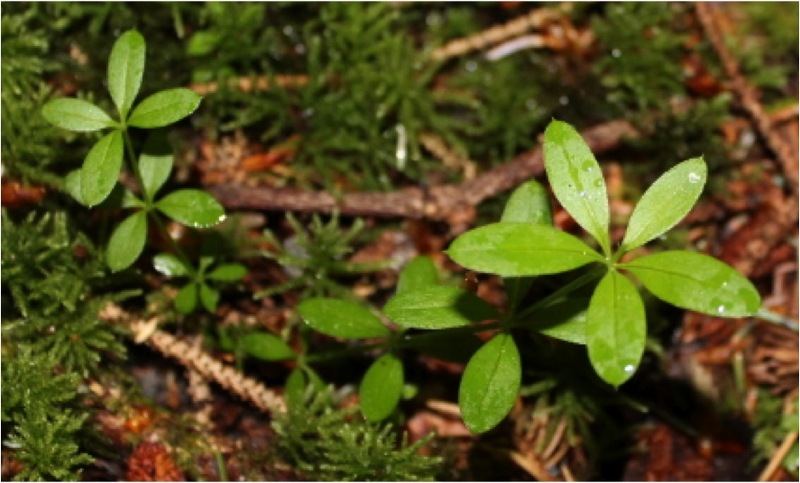 Sweet-scented bedstraw is a common species in BC, and is found in wet forest and along stream banks from lowland to montane elevations. It prefers shady locations and nitrogen-rich soils. It is a circumpolar species, found throughout much of North American and Eurasia. Cleavers (G. aparine) is a similar species; unlike cleavers, sweet-scented bedstraw has a sweet scent, rhizomatous stems, and smooth (not ‘sticky’) stalk. The leaves of cleavers tend to be narrower and with 6-8 per whorl. Additionally, the bristles along the leave margins of cleavers point backward (towards the stem), while those of sweet-scented bedstraw point forward. Sweet-scented bedstraw was used by some Ditidaht for a hair conditioner and the flowers were dried for perfume. Galium triflorum Michx. In Klinkenberg, Brian. (Ed.). E-Flora BC: Electronic Atlas of the Plants of British Columbia. Lab for Advanced Spatial Analysis, Department of Geography, University of British Columbia, Vancouver. Accessed 10/04/2014. Pojar, J. and MacKinnon, A. (1994). Plants of Coastal British Columbia. Vancouver, BC: Lone Pine Publishing. P. 330. Kelly Fretwell, Andrew Sheriff, and Brian Starzomski (2014).